This interview took place on: June 2014. JFH (David Craft): First off, I want to thank you guys for taking the time out to do this. I know you have a lot going on with the show starting in a few hours! It's great to see Archers Rise finally doing a headline show. Tom Cox: Yeah, definitely. We appreciate having the opportunity. We're really excited about tonight's show and are hoping for a good turnout! JFH (David): *Laughs* Well, I'm sure that won't be too much of a problem! I'm looking forward to hearing it. So, could you both share a little about what you most look forward to before playing a live show, especially one in your hometown? Matt Flood: I just love bringing good music to Corvallis, a town where there's not many good venues. Even here at the fairgrounds, we're not really "in" the town, so it's nice to bring up a great band from L.A., Kid Cadaver, and having them open for us, and Roman Tick from Salem. Tom: I think for me, it's funny because I really only get excited about a show about half-an-hour before we go on, just because of all the logistical things. And I'm not saying that's a good thing, and in fact, sometimes I wish I could chill out a little bit more, but I'm actually getting into this bad habit of trying to make sure everything goes really well. I'm not trying to sound like a dork, but I think it's because I really care about everybody and want them to experience the best show possible. JFH (David): Now regarding the name change from "Becoming an Archer," what exactly was the driving force with the decision to go with "Archers Rise?" Tom: Honestly, with Luke leaving, he was a good friend of ours who didn't have the time or energy to commit anymore, we just felt like it was right. It was a season of rising and overcoming a lot of odds, and we just felt it was more appropriate to be called "Archers Rise" than becoming something. JFH (David): Okay. So what would you say some of your major influences are? Just musically, thematically, or stylistically? Matt: Definitely Switchfoot is one of our models to go with. Not only musically, but with what they've done by being Christians who play really good music and being popular in both the Christian and secular markets. Also U2 and Coldplay, but more recently, Twenty One Pilots, they're up and coming. JFH (David): Yeah, that's some good stuff right there. I really like their recent work. Matt: Yeah, they really inspire us. JFH (David): I'll bet you'd get some good song material out of that. Tom: *Laughs* Yeah, with the theology, music, and all of that stuff. I enjoy doing a lot of the deeper thinking and typologies. Just that stuff you have to dig for. I feel like some of the shiniest gems you have to dig deeper for. We try to do that with some of our songs. But we do have some songs that are just corny and fun. I think you have to have both spectrums and that it's healthy to have both spectrums. JFH (David): So for you specifically, Tom, what would you say your path was from departing Falling Up to deciding that you wanted to start your own project? Was that planned before you left or did become a greater desire afterwards? Tom: After I left Falling Up, it was one of those things where I grew a little bit bitter about the music industry. If you're a creative person, and I imagine a few creative people will be reading this, you know that just because you stop being an artist doesn't mean that your brain stops working that way. I'd always had songs and stuff in my head that I was putting together, but finally I went through some pretty intense personal things, relationships falling apart, and then I really dove back into [music]. It was a good release for me and a way to get back to the Lord. Then these guys came along, and I basically begged them to play in my band. They eventually submitted. *Lee and Matt laugh* It's more or less "our" band. I don't want it to be "Tom's band." These guys definitely are just as, or probably more, talented than I am. JFH (David): Yeah, you all sounded great during the sound check in [the main auditorium]. What would you say some of the band's struggles are? You mentioned disillusionment with the industry earlier, and I think that's something most smaller artists would agree is a problem. Just generally, what are some of the issues that have arisen regarding that? Lee Edward: I guess from my limited experience, it's that things are changing so fast. You really have to be able to not just make a good product, but know how to present that product in a way that people know that it's worth their attention. It's difficult because there's so much noise, so you have to figure out how to get a couple of decibels above that threshold. We have to figure out how to be authentic musicians but also be good business people. Matt: And of course trying to get the finances. We've been really blessed by the people who've crowdfunded our EPs, but most of them have been from the local areas, Corvallis, Albany. JFH (David): Matt, you mentioned earlier about the difficulty of walking the line between following Christ and being musicians. For all of you, what does that look like as you're playing shows, recording albums, etc.? Tom: I find that my walk with Jesus is strongest when I'm discipling other people. Right now, I help out with a youth group at my local church. It's funny, because it forces me to prepare and I have to dive into the Word. Even though it comes from a place of like "wow, I've got to do this," it draws me closer to Jesus and helps keep me grounded. Matt: For me, it comes from understanding the gifts that God has given each of us in the band. For me, there's a need to use those gifts for God. I don't want to feel like I'm wasting those gifts. JFH (David): You all work on writing the songs, correct? Tom: Yes, we all do. JFH (David): So how would you say that your Christian faith influences the songs you write, especially with regards to the new EP? For the most part, there's not an explicit "praise Jesus" or stuff like that, but there seems to be a lot of spiritual imagery in there. Tom: As I said earlier, I think the deeper you dig, the brighter the gem. With "Pockets" and "Hello Sweet Pea," those are love songs inspired by my wife, and with Lee in the relationship with his wife and recognizing those giddy stages. And that's from the Lord, being able to celebrate that oneness with your spouse. As far as with songs like "Jupiter Bound," we wrote that from a very image-based place, saying "okay, we're in a rocket ship and we've got to go to Jupiter" and Jupiter is known as the King Planet, and it's very involved with ideas like the Star of Bethlehem being followed by the magi and such. JFH (David): That's some pretty grand imagery there. Tom: Yeah, so there's a lot of deep stuff there. *In a hushed voice*: But nobody's supposed to know that. JFH (David): So for the last question, what would be a favorite song for each of you, either to play or personally? Lee: I think, overall, "Ivy" is probably my favorite song to play. There's just so much passion. I normally play bass, but I don't on that song. I just play drums and I sing. With that said, though, there's a part in the song "Mirrors" where there's this pivotal moment that's very worshipful. JFH (David): You mean leading into the bridge? Lee: Yeah, right there, where it talks about the blood of Christ spilling out. There's also a part in "Even Pirates" in the second chorus where there's something musically there. Tom: I think "Jupiter Bound" might be my favorite, but honestly bro, and I'm not sure if this is a good enough answer, but it can change for me each night. Sometimes it's also "Even Pirates" or sometimes it's "Ivy." Matt: For me it is "Ivy." Maybe it just is the keyboard parts that I play that are just really fun. Maybe that's the only reason, I dunno, but I just like the song. JFH (David): Well, hey, thanks for taking the time out to do this. I look forward to the show tonight! Tom: Definitely! We're glad you were able to make it. 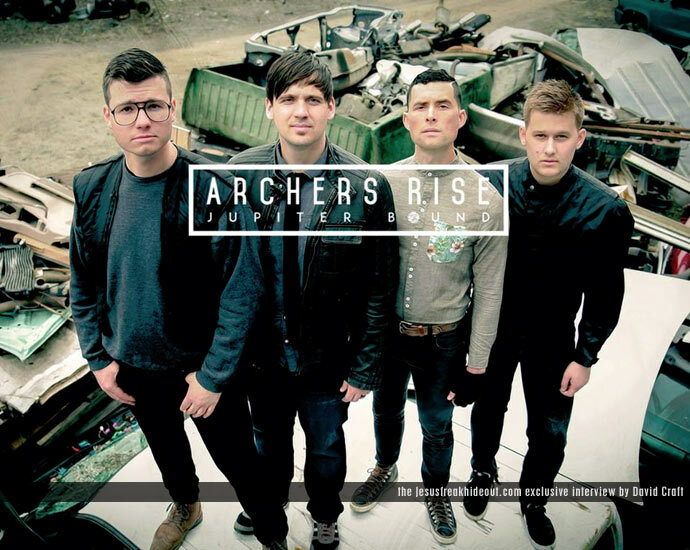 Archers Rise's latest album, Jupiter Bound is available now wherever music is sold!